"make sure that any suggested solutions are targeted at addressing the source of the problems and don't go beyond the scope of the BEPS project." ...The BEPS project carries a risk of "scope creep," Rolfes said. ... "We want to stay mindful of what BEPS is and make sure that in trying to solve those problems we don't come up with solutions that are broader than necessary or that have other implications, particularly with respect to the allocation of taxing rights between two taxing jurisdictions," she said. ...While Treasury endorses the sense of urgency around the BEPS project and the feeling that the problems must be fixed, Rolfes said that U.S. officials intend to be thoughtful about how the rules should or should not be changed. I'm not sure what is meant by being thoughtful. Being thoughtful might mean thinking through what you need to change, how you mean to change it, how you avoid over-breadth and under-breadth at the same time, how much everyone has to spend in order to get the result you seek, and whether what you write as rules can be coherently implemented in practice. Perhaps Rolfes is worried that if the OECD looks too closely at the allocation of taxing rights between two taxing jurisdictions, the world will see clearly that (1) the US is the most overreaching in this respect given that it taxes on the basis of citizenship and (2) the global North has long arranged the allocation to favor itself at the expense of the global South. "It's not just U.S. companies that engage in BEPS. Moreover, all agree that the BEPS we are primarily concerned with is driven by tax planning that is perfectly legal." Rolfes [added]that while much of BEPS income lands in zero-tax jurisdictions, some of the elements of tax laws that enable BEPS are attributable to tax competition that's occurring between the same taxing jurisdictions that are trying to solve BEPS. "This tax competition itself contributes to BEPS," she said. She acknowledges that "many of the current international standards, such as those relating to transfer pricing and tax treaties, have been developed over many years by U.S. tax policymakers working with their counterparts in the OECD." She says "We at Treasury are humbled ...And we want to make sure that any solutions we have are targeted to that problem and not to other problems." The BEPS project should clearly undertake a cost-benefit analysis of the possible alternatives...clearly I think if the BEPS project is going to be successful, one has to weigh the benefits of the current [OECD] Transfer Pricing Guidelines, in addition to the costs." "To me, that seems much more important than an OECD initiative. I don't understand how the two are going to work together. If Chairman Camp achieves his goal by the end of the year of putting the entire international tax system up for a vote, shouldn't that be our starting point?" Treasury needs to be engaged in a significant tax policy initiative like BEPS, which would be undertaken by other countries with or without the U.S. ...Having a seat at the OECD table provides the United States the opportunity to be a part of the dialogue and to have an influence on how international tax rules are developed ... [and] other countries are not going to wait for the conclusion of the U.S. Congress's reform debate. So the US sees the OECD as playing an important role, and one that could have negative impacts on US policymaking choices absent Treasury's involvement. And this exchange shows that at least some at the Treasury are capable of articulating at least a sense of understanding the concept of regulatory overbreadth. But you could interpret these statements as at best tepid support for the OECD's initiative, at worst a foreshadowing of resistance to come. The US torpedoed the OECD's efforts on harmful tax practices, only to come up with the much more expansive and awe-inspiring FATCA on its own. If the US torpedoes BEPS, what will be in store for the taxation of multinationals? It should be a fascinating ride. Labels: corporate tax, governance, institutions, OECD, politics, tax policy, u.s. Isn't it astonishing that at the very moment the USA is twisting arms the world over ostensibly to crack down on tax havens and the erosion of the tax base they help perpetuate, Bloomberg could run this headline without irony or shame, and we can get a brand new quote from yet another American lawmaker about the virtues of making the US a tax haven. This time it's not Paul Ryan who wants to "make America a tax shelter" but his friend Devin Nunes, who says the US ought to abandon corporate income tax, and substitute for it a cash flow consumption tax, in order to "make the U.S. the largest tax haven in human history." You just cannot make these things up. You remember Nunes, I hope--yes, that's him, the co-chair of the international working group on tax reform convened by Camp & Levin. Yes, that Levin, the one that wrote FATCA, the legislation that is supposed to stop Americans from cheating on their taxes by using other countries as tax havens. Of course you can say that in substance the two are very different--Levin's focus is to stop Americans hiding cash overseas in foreign bank accounts, while Nunes just wants to let corporations pay less tax on the income they earn in the US. And a cash flow consumption tax might not be evil. But using the tax haven and tax shelter rhetoric as a marketing strategy is objectionable. Either you think tax havens and tax shelters are an abuse of the rule of law, in which case you shouldn't try to turn your country into one, or you think they're just dandy in which case you shouldn't try to shut everyone other country down to capture the market for yourself. Labels: corporate tax, tax culture, tax policy, u.s. This special issue of the Washington Journal of Law, Technology & Arts contains papers contributed to a conference held at the University of Washington School of Law on April 20, 2012. The conference, entitled Mobile Money in Developing Countries: Financial Inclusion and Financial Integrity, was organized by the University of Washington School of Law with the support of the Linden Rhoads Dean’s Innovation Fund, Deakin University School of Law, Australia, and the United Nations Commission on International Trade Law (UNCITRAL). Mobile Payments In The U.S.: How Disintermediation May Affect Delivery of Payment Functions, Financial Inclusion and Anti-Money Laundering Issues by Erin F. Fonté. The recent and widespread availability of affordable mobile phone technology in developing countries has paved the way for the development of a number of mobile money and electronic remittance services. One of the most successful of these services is Safaricom’s M-PESA program, launched in the East African nation of Kenya in March 2007. Since then, the program has successfully enrolled 15.2 million users, transferred more than US$1.4 trillion in electronic funds, and contributed significantly to poverty alleviation and financial inclusion efforts in rural Kenya. This Article seeks to trace the development of M-PESA in Kenya, provide a snapshot of the Kenyan implementation of and experience with the program, and consider the role that services like M-PESA might play in national and international anti-money laundering and counter-terrorist financing efforts. Global Witness issued this must-watch video this week, which demonstrates how leaders steal from their own people with the help of lawyers and bankers. The crime itself is bad enough, but the blasé demeanour of these perpetrators is truly offensive. They must have done this a lot in order to view the proposed transactions in such a banal and relaxed way. Though one woman clutches a pillow quite closely as she calmly explains how to take care of the details. Is she nervous about her illicit behaviour, or just eager to close the deal? How to steal your state's resources for personal gain, in 8 easy steps. Step 1: get control over state land allocation and resource extraction licensing by becoming a state authority. Step 2: open a series of accounts in trust or corporate form, in places will hide your identity and assets from other state authorities, for example, in "the new Switzerland." Step 3: have the state sell land at nominal prices to your family members and/or companies you control. Step 4: when buyers inquire at your state offices about making land leases or purchases, direct them to your family members. Step 5: have your family members and lawyers explain to the buyer that the purchase will require two purchase contracts plus a side arrangement for licensing rights. Step 6: write the first purchase contract for a nominal price to legally transfer the property locally but generate minimal (or no) profit. Step 7: write the second purchase contract to direct the remaining purchase price to be paid directly to one of the offshore accounts. Step 8: have the buyer write the side arrangement fee directly to one of the offshore accounts. Query: how do you make sure your buyer actually pays you the second purchase price? That is, if the first contract documents the sale, what stops the buyer exercising ownership rights if he double crosses you on the offshore bank contract? The woman in the video says no problem, this has "been done." How has it been done? Are we talking about hiring thugs to break kneecaps? I've heard of similar triangular contractual arrangements in other equally criminal schemes, and I always wonder about how that aspect works out. Honor among thieves? Can States Shame Each Other into Good Behaviour? We seek to answer the question as to whether international law imposes meaningful constraints on state behaviour. Unabated drone strikes by the dominant superpower in foreign territories, an ineffective United Nations, and persistent disregard for international law obligations suggest that the sceptics have won the debate about whether international law is law and whether it affects state behaviour. We argue that such a conclusion would be in error because it grossly underestimates the complex ways in which IL affects state behaviour. ... We show that IL is enforced by states, courts, and international organizations by the imposition of shame sanctions on offenders and that these sanctions affect state behaviour in the same ways that traditional coercive sanctions do. In doing the above, we also develop the concept of a shaming reference group. I'm in general a skeptic, viewing the tripartite failures highlighted in this abstract as overwhelming evidence that in the international community, might makes right, full stop. The tenth anniversary of America's unprovoked war on Iraq, which is now clearly characterized as a strategy to gain control over its oil resources that was planned far in advance of 9/11, seems too ample evidence backing the skeptical view. But I'm willing to engage that social pressure might have some amount of impact on state behaviour in some cases. At least, I am willing to believe that states will work hard to appear to be good citizens in the international legal order, and that this might cause some leaders to make decisions differently than they might absent shaming in the international community. But I remain at heart a skeptic so I will continue to believe that in practice states will use any power they have to achieve their ends at the expense of other states (much as leaders will do the same at the expense of their own people if they can get away with it). States are likely to be the principal enforcers of shame sanctions. ... States make evaluative opinions about other states all the time. Some have the resources to make elaborate justifications and provide evidence for those opinions in a legal manner. One example is the United States State Department’s annual human rights reports. These have come in for harsh criticism as being partisan. ...partisanship is a major problem for shaming. The US has also been accused of hypocrisy. Attacks based on the lack of neutrality and credibility to engage in shaming are severely debilitating, and do suggest that neutrality, or a perception thereof, is important if shaming sanctions are to work. This is not to say that shaming by individual states should be ignored altogether. Some states will be persuaded by the US State Department’s reports, and it must ultimately fall to a process of democratic debate to determine if the state being shamed is indeed deserving of punishment. There is nothing stopping Iran and Venezuela from issuing shaming reports of their own. If members of the international community believe these reports are the products of serious investigation and research, they will be credible. On the other hand, if they are merely propaganda, they are likely to be ignored. This suggests major cognitive bias problems if shaming is to be a regime for uncovering egregious offenders, at least, if we seek any sort of even-handed regime. If we don't worry about that problem, I think we're back to might makes right, and shaming just becomes another resource for wielding power to act in self-interest, while simultaneously shielding the shamer from reciprocal pressure. This is a frightening and ultimately very discouraging status quo. It suggests that when we talk about shaming the result will not necessarily be better behaviour, but rather behaviour aimed at currying the favor of those who decide whom to shame. It worries me if that is the best we can do to guard against states doing terrible things to each other and state leaders dong terrible things to their people. Recent press reports describe a large increase in January tax receipts as taxpayers shifted substantial amounts of income forward into 2012 in order to avoid the higher taxes anticipated for 2013. ...We have been told, again and again, that there must be lower tax rates on accumulated foreign earnings in order to provide an appropriate incentive for U.S. multinational companies to repatriate the enormous sums they hold offshore. ...It turns out that incentives can be created just as well by raising taxes as by lowering them. Nice. Empirical evidence that to get cash repatriated, the trick is to raise taxes with enough lead time for companies to move thing around. Best part: this process is totally repeatable next year. Every penny from this sale ought to go to the City of Montreal. It's not much, but it might cover a few weeks worth of corruption maybe. Public disclosure of global corporate tax info, coming soon in the US? The legislation requires companies engaged in the commercial development of oil, natural gas, or minerals that file a yearly report with the SEC to file an additional detailed annual report (new Form SD, which is separate from countries' 10-K annual report) listing all their payments, including taxes, fees (including license fees), royalties, production entitlements, bonuses, dividends, and payments for infrastructure improvements. Payments of at least $100,000 during the most recent fiscal year must be listed. ...Reports must be detailed and specific, listing payments to each foreign government, foreign subnational government, and the U.S. federal government. (Payments to subnational U.S. governments, such as state governments, need not be reported.) The reports will be publicly available online. More specifically, the reports must separately list each project and the types and totals of payments made in connection with each project; the types and totals of amounts paid to each government, including a separate list of the governments that received payments; the total payments by category; the currency in which the payments were made; the relevant financial period; and the business segment of the company that made the payment. [T]he SEC wrote that it had rejected commentators' suggestions to exempt firms operating in countries where the required disclosure is prohibited because the agency is skeptical that such prohibitions actually exist, and allowing exemptions would violate the spirit of the law. Furthermore, it said that allowing that kind of exemption could encourage foreign countries to pass anti-transparency laws or to interpret existing laws in a harsher fashion. "API wants to push us back to a time when the U.S. had few tools to add accountability and stability to the inherently unstable energy sector," Cardin said. "Congress and the SEC carefully crafted a reasonable and very manageable reporting requirement that will bring greater transparency to the oil, gas, and mineral sectors." "The U.S. economy and our values substantially benefit when our companies are working in oil-, gas-, and mineral-rich states," Lugar added. "But the benefits will not be realized if investments serve to entrench authoritarianism, corruption, and instability. With oil prices high and volatile, our economy needs more transparent markets, not less. "Resource companies can believe whatever they wish and make any communication they wish about their payments to foreign governments, 'the resource curse,' or the benefits or costs of transparency; they have done so throughout this process. What resource companies may not do is impede the power of the legislative branch to require disclosure of objective information to fulfill compelling public policy objectives, including the strengthening of American national and energy security and investor protection." It remains to be seen whether industry will be successful in pushing back the EITI regime; if not, we should start seeing the additional disclosure I believe by September of this year. So here is a question. How many multinational extractive industry companies are there in the world, and how many will be covered by the US EITI regime? In other words, if and when the US rules are in place, how many extractive industry companies will not have their information revealed through these disclosure rules by virtue of affiliation with US companies? Is it a few, many, or most? If anyone knows whether this is known or could be ascertained, I'd like to know. Labels: corporate tax, disclosure, EITI, transparency, u.s.
Water comes up on occasion as a topic related to taxation and society because of its character as a public good and a private commodity. A reader sent this infographic of interest, click on it to see a bigger version. Interesting advice on the bottom: to save water, drink beer (instead of milk). Or drink water, instead of everything else. It's so strange to me that it take more water to make instant potatoes, which are dehydrated potatoes, than to make the actual potatoes. I assume the same logic applies to things like powdered milk, detergents, etc. Anti-austerity Protestors in Portugal: "Screw the troika, we want our lives back"
Tens of thousands of people filled a Lisbon boulevard during Saturday's protests and headed to the finance ministry carrying placards saying "Screw the troika, we want our lives back". The troika is a reference to the European Commission, the International Monetary Fund and the European Central Bank, the lenders behind the country's financial bailout. Many protesters were singing a 40-year-old song linked to a 1974 popular uprising known as the Carnation Revolution. Portugal is expected to suffer a third straight year of recession in 2013, with a two percent contraction. The overall jobless rate has grown to a record 17.6 percent. The marches were powered mostly by young people among whom unemployment is close to 40 percent. ...After several years of tax increases and welfare cuts, austerity is poised to deepen as the government looks for another $5.2bn to cut over the next two years. The national health service, education, pensioners and government workers are likely to be the hardest hit. The government is locked into debt-cutting measures in return for the $102bn financial rescue set up in 2011. More tax hikes and spending cuts are on the way for Portugal: when it comes to the IMF, you must pay your debts regardless of the consequences. That was always the IMF way of course, but when austerity plus regressive taxation was being imposed on impoverished countries with disastrous social and economic results, the global North didn't seem too bothered by it. 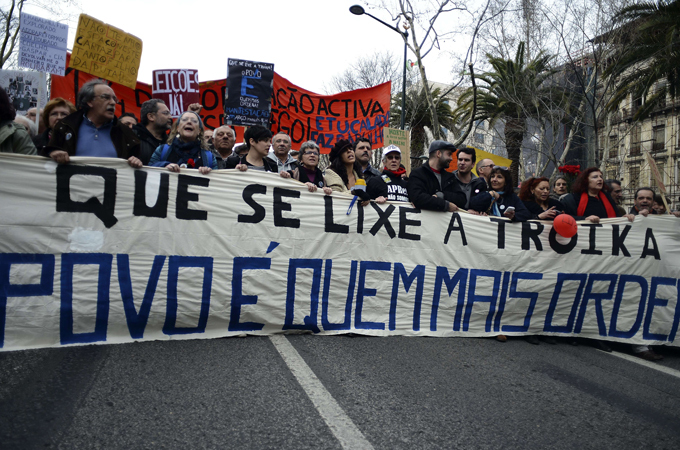 One protestor in Lisbon is quoted as saying, "This government has left the people on bread and water, selling off state assets for peanuts to pay back debts that were contracted by corrupt politicians to benefit bankers." That scenario is lifted straight out of the IMF's playbook throughout Africa in the 1990s. ... Because neither PPL nor Entergy raised the treaty issue, the Tax Court, the Third Circuit, and the Fifth Circuit relied solely on the requirements of section 901 and the regulations that define a creditable tax. The complete lack of any reference to the U.K.-U.S. tax treaty is extremely curious because the treaty provided more than adequate grounds to conclude that the windfall tax was creditable under U.S. law. ...The [applicable] U.K.-U.S. tax treaty identified specific existing taxes imposed by the United Kingdom and designated them as income taxes for which a credit would be available (covered taxes). ...[T]he language describing the indirect credit under article 23(1) does not specifically refer to an "income tax" but only to a "tax paid to the United Kingdom by that corporation with respect to the profits out of which such dividends are paid." ... The failure of the taxpayers in PPL and Entergy to raise the treaty issue is all the more curious given the IRS's recognition in a coordinated issue paper that the windfall tax involved a treaty issue. [The IRS claimed that the Windfall Tax would not be creditable because it was a one-time levy imposed on appreciation in value, but the] IRS's analysis of the treaty issue is not ... convincing. ... The Supreme Court need not decide whether a formalistic or substantive analysis applies under section 901 because the U.K.-U.S. tax treaty provides an alternative argument -- a definition of an income tax at least as broad as that under section 901 and the application of a substantive analysis to determine if a tax satisfies that definition -- to conclude that the windfall tax is creditable based on the Tax Court's findings. ...By ignoring the existence of the U.K.-U.S. tax treaty, the parties and the lower courts in PPL have overlooked a significant aspect of the case. The Supreme Court should not repeat their mistake. I agree with David that the treaty argument should have been made, even though I am less convinced than he is that on substance the "windfall tax" is really even a tax at all--I think it looks like a purchase price adjustment. But that was also not an argument brought up by anyone at trial, instead the IRS conceded that the "tax" was in fact a tax. Having done so, the treaty does seem to present the more permissive regime. But a big part of this story is David's puzzlement about the treaty being overlooked by all the parties and all the judges, despite the IRS having previously articulated a treaty-based position on the very tax in question. Can it be that the parties just assumed the treaty did not apply, or if it did apply, did not provide a different result? Can it be that they all made those assumptions without undergoing a close analysis, without doing any research? If so David is suggesting that a big mistake has potentially been made, and if the Supreme Court rules against the taxpayer in PPL, it may have been a quite costly mistake. That's bad for the taxpayer and bad form on the part of the lawyers, but intriguingly, it also suggests that even in a top fight litigation situation like this, it is possible that the tax law experts on both sides overlooked an applicable legal regime, most likely because the regime in question involved international law rather than a statute in the tax code. That is a fascinating observation for those of us who like to think about the rule of law as the product not of legal texts by themselves but of their dynamic implementation in practice. If a legal text exists but is ignored by the legal system, can it really be said to be law at all? David is suggesting that the US-UK treaty is a tree falling in a forest, unheard by anyone. Usually I am worried that people will imagine that they hear trees falling in forests when there are no trees at all--that is, I worry about non-legal assertions being treated as equivalent to law (for example, OECD guidelines). David's article suggests that the opposite may have happened in this case. Labels: international law, rule of law, tax policy, u.s.
Can there be an IGA with a country that has no treaty or tax information exchange agreement? Yes, Eggert responded. It would have to be a Model II or nonreciprocal Model I . Amendments would have to be made to add information protections and assistance provisions. With respect, this does not accord with what we have been given to understand so far about these IGAs. One need only read the preambles to the IGA models and signed agreements and consider the treaty power briefly to see that there is a very large legal difficulty here. As I have said before (and have a feeling I will be saying repeatedly), the Executive Branch cannot simply bind the US to any agreement it wants to without doing violence to a constitutional process that has been expressly laid out and subject to decades of analysis and debate by the country's most preeminent legal minds. This is why the IRS has been very quietly implying that the IGAs interpret existing treaties. I don't agree on the merits that this could possibly be true, but the IRS needs it to be true because if it is not true, the only alternative is that the IGAs are sole executive agreements entered into by the executive branch with no congressional oversight whatsoever. That puts them on the most precarious legal ground in terms of foreign policy power in the US, and by this statement Eggert pushes them closer in that direction. Does Treasury have authority to make IGAs? Eggert argued that IGAs are within Treasury's statutory authority to make FATCA regulations (section 1471(b)). Treasury and IGA signatories are discussing how to make domestic implementing laws consistent. Again with all due respect, this just simply is not true as a matter of US law. The executive branch does not have the power to authorize itself to enter into treaties without congressional oversight. It is the constitution that provides the treaty power, and Congress is expressly involved. Congress could have granted the executive specific authority in this case, as it has done in other cases, but it clearly did not do so here. It is not clear what Eggert means by "making domestic implementing laws consistent." Maybe that refers to the domestic laws of treaty partner countries, which will have to change their data privacy laws to accomodate the information sought by the IRS. If so, that has nothing to do with the US. From what we have seen so far, it seems clear that the IRS is treating the IGAs as operational once the other country so indicates it is operational from their perspective (cf Mexico). Arguing that the authority is implied within Congress' mandate to Treasury to issue regulations under 1471 is blowing a hole through the treaty power. It argues that Congress empowers the Executive Branch with treaty making authority with each and every directive to enact regulations. It makes a farce of the congressional executive agreement process that has been begrudgingly accepted as authentic by most constitutional scholars today. And never mind the old standard, the Article II treaty power. By this logic if the President wants an international agreement--any international agreement of any kind--he never needs to consult the Senate again, he can simply find some reference by the Congress directing his regulators to regulate. If Eggert is right in this assessment, it is not a stretch to see this as the beginning of the end of the Article II treaty ratification process in the United States. In other words if this works, then it's anything goes when it comes to the Executive Branch overriding domestic law with an international agreement. Existing IGAs will be interpreted to say that countries may choose the definition of an item in the final regulations which came later in time. Treasury will not amend IGAs wholesale when regulations change, Eggert explained. This may seem benign--it provides flexibility despite the apparently rigid parameters of the documents (which are treaties, after all, and not so easy to just unilaterally alter at whim). But this is in fact very interesting as a legal matter because it quietly moves the world a little closer to yet another US tradition that many people in other countries find odd if not outright incompatible with international law, namely, the treatment of treaties as equal in legal status to other laws, including statutes and case law, so that treaties can be overridden at any time by a new statute or judicial decision. But it goes a further step to include regulations within that overriding scope--where they might not so clearly belong even under US law. In other words, the IRS is saying that not only does the "last in time" rule apply to IGAs (as they would to any US international agreement), but we'll apply the last in time rule to other countries too (even if under their own laws the treaty would override later-enacted domestic laws); moreover the last-in-time rule is now extended to treasury regulations (a unilateral law that will be used to "interpret" a bilateral agreement, yet another controversial treaty interpretation position), and finally we are going to make it the treaty partner's choice to pick among the regimes to get the best result (which treats treaty partners not as negotiators in a bilateral agreement but rather in the same way as taxpayers subject to an elective regime). It is getting progressively more difficult to keep up with the sheer volume of violations of laws and norms being undertaken by the IRS in order to get FATCA to work. It is rather disheartening (in the sense of being a scholar who studies legal process as though it matters) to realize that to many or most people involved in this project, all of these violations are just technicalities and semantics getting in the way of a result everyone wants. Labels: FATCA, governance, institutions, international law, IRS, rhetoric, rule of law, treaties, u.s.
Who is to blame for Starbucks-style tax dodging? The answer is "government" if you believe the Telegraph, from an opinion by "Richard Emerton, Head of Board Practice at Korn/Ferry Whitehead Mann" (an executive recruiting firm). He's enthusiastic about tax competition: the kind that will keep European companies "competitive" on a "level playing field" by lowering their taxes on purpose, and he's keen to blame government alone for any failure of tax policy to date, e.g. the kind of failure that led to the public shaming of Starbucks and friends. ...The UK Government has done a good job in creating a tax system that encourages businesses to set up in Britain and the Chancellor has made it clear he wants international businesses to operate here. It is therefore important he does all he can to prevent European politics from perverting his well-intentioned efforts to look at the problem from an international perspective. What strikes me as counter-productive about the debates that have taken place over the likes of Starbucks and Google is the anti-business rhetoric from many politicians in the search for public approval. A degree of anger from the public may be understandable, but is it directed at the right targets? Korn/Ferry’s latest “Boardroom Pulse” survey of FTSE 100 chairmen suggests that business leaders think not. While agreeing that the public has a right to be angry, many respondents felt that dissatisfaction should be directed towards the tax legislation and those in charge of it, rather than the companies observing it. Indeed, it is governments that have failed to modernise international tax legislation in decades, despite the wholesale changes that have taken place in the way businesses operate across borders. Our professionals have been directly involved in writing and reviewing the applicable Treasury regulations ... which govern tax-free separations." The chairmen we surveyed pointed out that company directors have a fiduciary duty to minimise tax bills, providing they are acting in an ethical manner and are not inviting legal risks. Which raises a fundamental question stemming from the tax issue – should the primary duty of a company’s board and senior management be to its shareholders, or to the wider moral and social concerns of the public? The chairmen we talked to were divided. Yes, business leaders have a duty to drive value for their shareholders. And yes, businesses also have a duty to act responsibly as members of wider society. It is the responsibility of the leaders of these businesses to strike a balance and most of them make significant efforts to do so. Inevitably, sometimes they get this balance wrong, but attacking them for trying to drive shareholder value while playing by the rules of the game will solve little. A better focus of our energies is to ensure that international tax laws are strengthened by the regulatory framework governing businesses, allowing them to focus on achieving long-term sustainable value for shareholders and for society. However, policymakers must ensure that this isn’t achieved at the expense of a level playing field for businesses across the world, not just one part of it. The author channels every "we paid all the tax that is legally due" defense ever given in the face of public pressure against tax dodging. He also invokes the "level playing field" metaphor, which is always invoked for every destructive tax policy that was ever invented in response to every other destructive tax policy that was ever invented. So three cheers for tax industry rhetoric, bandied about in any tax policy dialogue to make sure no one thinks too hard about the systemic choices at issue here. Score ten points to Mr. Emerton in pointing out that blame for tax dodging rests in a legal system that has been specifically designed to encourage it. But take away nine points for failing to mention the big part business plays in constantly perpetuating that kind of design. Then take away two more points for failing to mention that some things only look like dutiful tax minimization until the tax authority figures out what you are doing, and then they are clearly tax evasion. Cf Dow, Ernst & Young, and Jenkins & Gilchrist tax partners, and that's all in just one week. That puts the column in the negative territory, which is right about where the author appears to think that the tax liabilities of fiduciary-duty-abiding corporate managers ought to keep their companies' tax burdens.